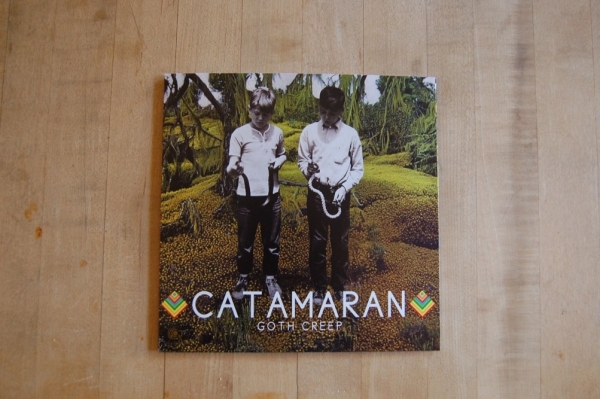 This second entry in our split 7" series pairs RUMTUM (Columbus, Ohio) with Catamaran (New York, New York), two artists who produce a range of electronic beats and patterns to create infectious tracks. 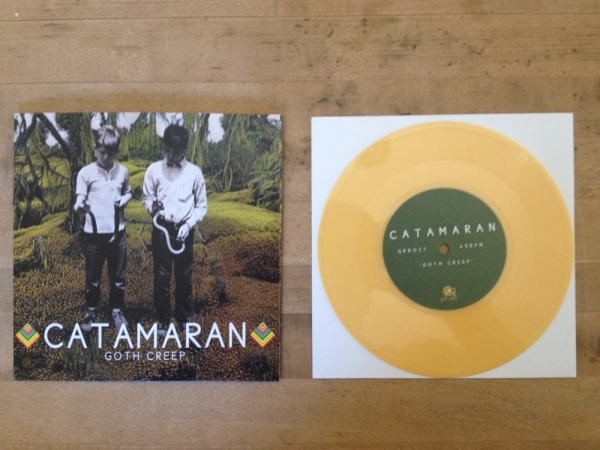 There's an otherworldly, distant urgency to both "New Lands / Sea Gypsies" and "Goth Creep". 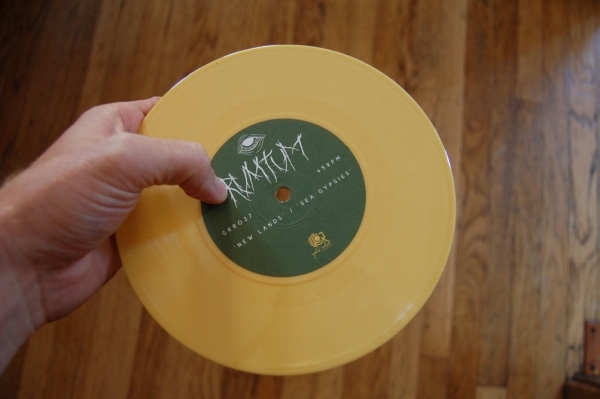 The limited edition vinyl version features two original productions while the digital release includes reciprocal re-workings by each artist. Mastered by Nick Carden in the Blue Room (Oakland, California). 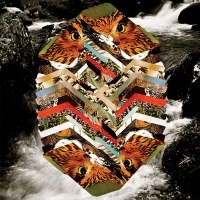 The artwork for this release was created by Ted Feighan (Monster Rally) in cooperation with the artists. 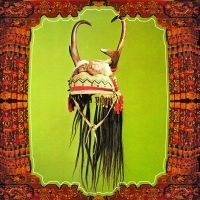 The digital cover seen above is an amalgamation of the dual covers found on the vinyl edition. 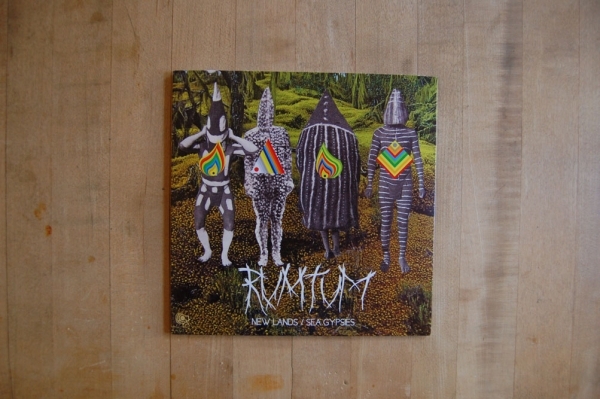 "RUMTUM creates pulsing, blunt beats seguing in and out of movements. 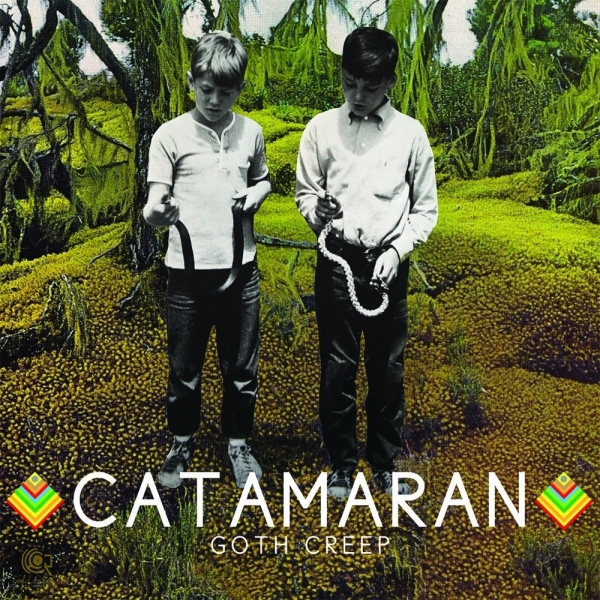 Catamaran takes a more overcast path but also more direct in it’s melody, as if you played a Joy Division single while it was being melted into certain death." "The outcome, as you’d imagine, is infested with mellow tribal overtones and enough summertime vibes to last you until next summer." 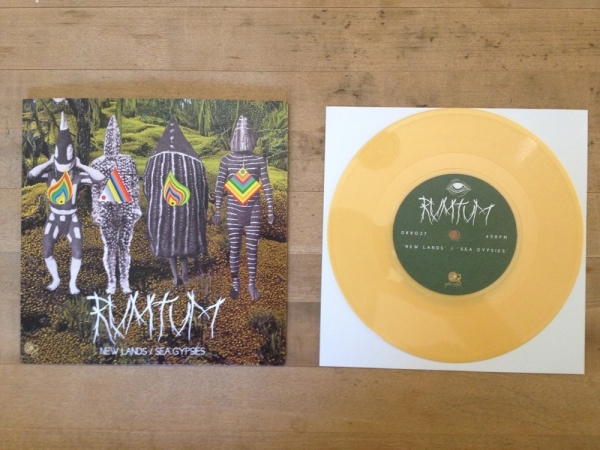 "New Lands / Sea Gypsies is RUMTUM meditating on the finer points of deep house. He's brought along his leaky faucet samples that ping and echo down the caverns of his production, but there's light at the end of the tunnel and a fiesta to enjoy." "The results are the absolute perfect blend of swirling, halcyon ambiance and momentous, Drive like electronics." "A groovy mix of thick, chilled beats and shimmering guitars which soundtracks this sleepy Monday morning perfectly." "Characterized by its playful and lush soundscape, "New Lands" holds a power that evokes the energy of the dancefloor while maintaing a sleepy vibe more apt for leisurely listening. RUMTUM's new track opens with ascending arpeggiated synths, bubbling noises, and crackling percussion, eventually booming into a deep rhythmic segment led by the bass and hi-hat and interlaced with obscured vocal samples." "Both electronic powerhouses bring palatable takes on rhythmically straight tracks emphasizing an anthropomorphic sprint. For however simple the individual tracking on Goth Gypsies may seem, the undeniable talent on both sides of this release lies in an instinctual collaging. While similar, both tracks carry their independent personalities recalling the underground club thud or a dreamy synthesis." "Columbus, Ohio upholds its anomalous tradition of producing top notch beatmakers with this RUMTUM remix of Catamaran‘s “Goth Creep”, throwing a lurid wash of tropical breakbeats and gorgeous samples over the original." "I am very much of the opinion that the inherent beauty of this piece of music is its’ simplicity. 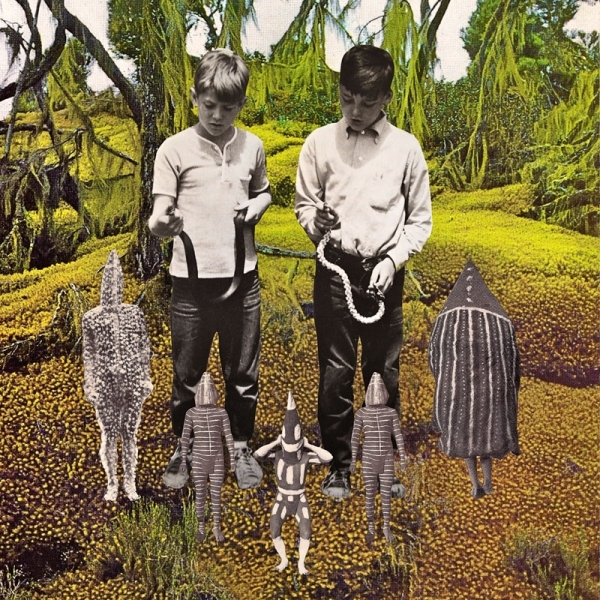 The drum claps have the slightest echo, resonating high above the bliss synth/vocal drag." 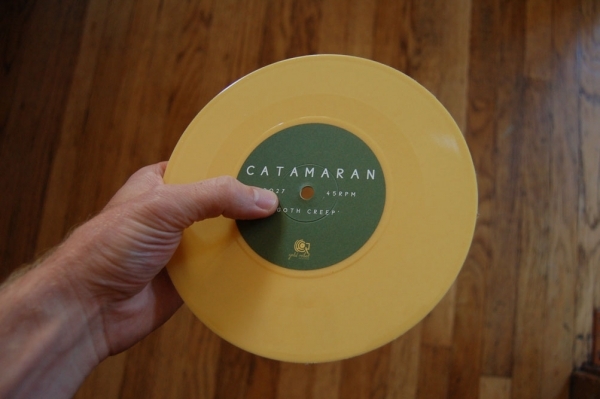 "Catamaran’s music is firmly rooted in the pop persuasion, but his penchant for deep bass lines and electronic flourishes ensure that his infectious melodies won’t soon be forgotten." "We’re offered a reverberated guitar, 80′s synths and industrial drum beats as well as distant, eerie vocals from Catamaran on Goth Creep and a real flip round by RUMTUM on the remix as he chops the vocals up, adds some lighter piano, softer drums and generally takes it more on the dreamy side of things. 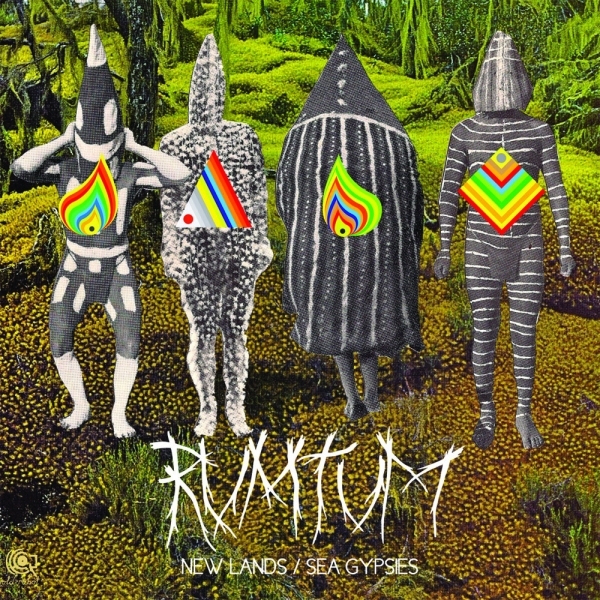 Then we have the six minute long New Lands / Sea Gypsies as RUMTUM’s original offering which starts off as a more industrial sounding track with old school drum samples and rippling bass. However, the second half introduces a more funk baseline and jungle beats for an overall more upbeat result. Catamaran’s remix takes the more industrial side of this track and adds his signature eerie vocals stylings upon it, for an all the more spectral finish."